For no reason whatsoever we have an installment of the favorite VGMs dedicated solely to the main monkey, the great gorilla, the apt ape, Donkey Kong. We have Rare-composed music, spinoff music, and a medley based off of his arcade days. Grab a nutritious banana, sit down, sit back, and crank up the volume to these enticing tunes. One of many fantastic and tantalizing themes heard throughout the course of Rare's refreshing of Donkey Kong in Donkey Kong Country, Fear Factory plays in the penultimate world, an industrial area full of - as you can probably guess from the song's title - factories. One of the more difficult levels involved oil barrels that would have flames emerge from them intermittently. Players had to time their jumps carefully to avoid getting burned. The level's home stretch was full of these oil barrels suspended over a bottomless pit. Timing was everything. Fear Factory would be remixed in the Nintendo Wii classic, Donkey Kong Country Returns, set in some of the - you guessed it - factory levels. 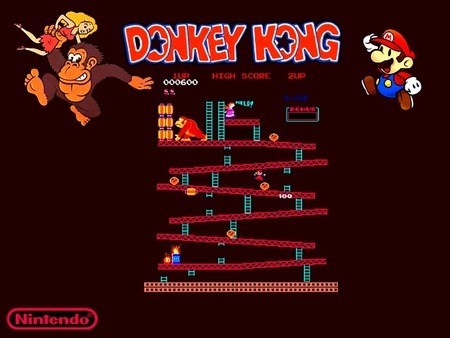 DK: King of Swing is a game with similarities to a classic NES game, Clu Clu Land. 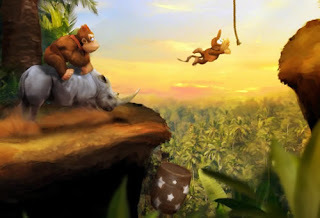 The game is a drastic departure from the standard gameplay players experienced throughout the Donkey Kong Country and Donkey Kong Land trilogies. Players use the shoulder buttons as DK's hands, grasping pegs to climb up mostly vertical levels, all the while avoiding or defeating familiar K. Rool enemies like Kremlings and Zingers. Necky's Canyon is my favorite of the themes heard in the game. In this level, the concept of grabbing and tossing rocks at enemies is introduced. 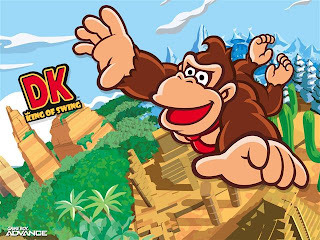 It's a shame King of Swing was overlooked because of its dissimilarities to Donkey Kong Country. Most critics, including myself, enjoyed the game. Like DK King of Swing, Donkey Kong: Jungle Beat was another departure from what players had known to be Donkey Kong-style gameplay. Instead of bashing Kremlings, DK entered various kingdoms, bashing bosses like rival Kongs, robotic elephants, and foul fowl. That wasn't the only unique part about the game. 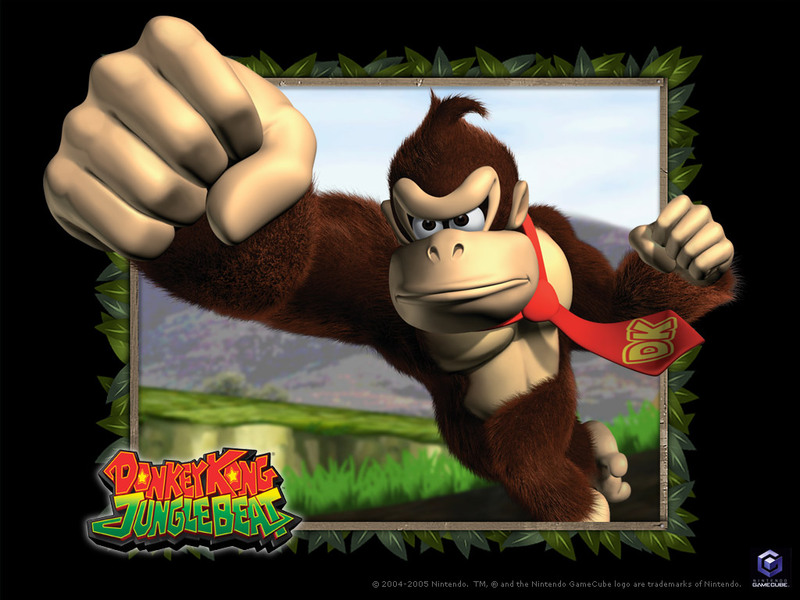 In the GameCube original, players utilized a bongo controller to move DK, attack, and grab bananas. By earning high combos and collecting loads of banana bunches, DK could earn medals to unlock more difficult kingdoms. The soundtrack was composed by Mahito Yakota, who would go on to receive full orchestral treatment to his music with a little known game called Super Mario Galaxy and its sequel. I sort of consider Donkey Kong Country 3 to be the black sheep of the Donkey Kong Country trilogy. It's a competent game, don't get me wrong, but the absence of Donkey Kong completely and Diddy Kong made something amiss for me. That plus the clear drop in quality of the soundtrack from DKC2: Diddy's Kong-Quest to this game also influenced by opinion of the game. It's my least favorite of the trilogy, but like I said, it's still a competent game. I was born in a time where arcades were still around in the United States, and I remember playing the Teenage Mutant Ninja Turtles arcade game and Turtles in Time at a mall that was on the way home from my grandma's (dad's side) house. I never got the chance to experience Donkey Kong in arcade form, but I did suffer greatly through having to play it just to be able to face the final boss in Donkey Kong 64. Stupid game design decision 101. Regardless, I hope you enjoy this medley of music from the Donkey Kong arcade game from this Super Smash Bros. Brawl rendition. This kong-frontation with the music of several Donkey Kong titles is now over. If you missed a previous installment of the VGMs, check out the SuperPhillip's Favorite VGM Database. It has all the VGMs I have ever commented on in convenient clicking form. Until next week, these VGMs are going back on summer vacation.